Thermometrics makes a variety of rugged protection tubes and thermocouple assemblies for the metal processing industry. 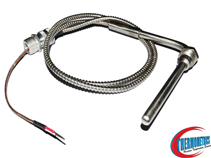 We produce Magnesium Oxide (MgO) thermocouples for heat treating applications. 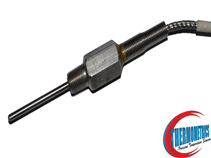 Angle thermocouples, or commonly known as "over the side" sensors with protection tubes are also available. Most sensor assemblies for use in this particular industry are produced with connection heads and protection tubes. Thermometrics thermocouples are used to measure the process temperature of many metals, including copper, steel, aluminum, nickel, platinum and others.